CORTLAND AND HONEYCRISP are two of the more popular apple varieties in New England, albeit for different reasons. The all-purpose Cortland has been a New England staple for more than a century. Honeycrisp is the region’s rising star—it has only been available commercially for the past 20 years. Cortlands are moderately juicy, with a sweet-tart flavor that is slightly less tangy than a McIntosh. 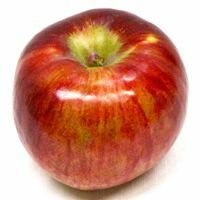 A deep, purple-red apple with yellow streaks, its white flesh browns slowly when sliced, making Cortlands ideal for salads or served with cheese. Cortlands hold their shape well when cooked, making them a good choice for pies. A cross between McIntosh and Ben Davis, Cortlands were developed at the New York State Agricultural Experiment Station in Geneva, New York, in 1898. 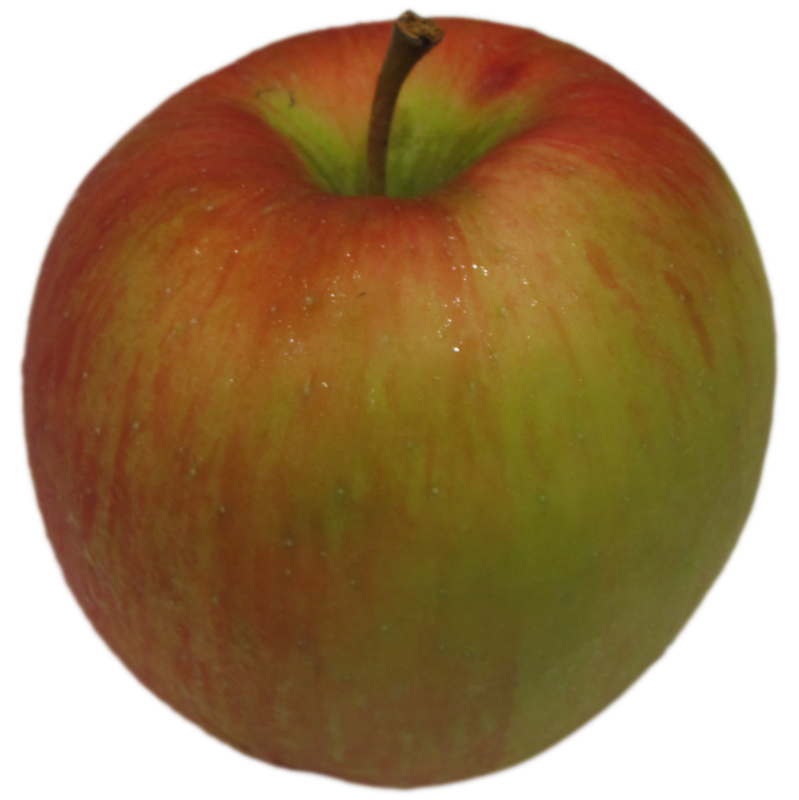 Honeycrisp can range in color from all red to green with red striping. Their flesh is cream-colored, crisp, and very juicy. Honeycrisp have a sweet, slightly tart flavor. They are excellent for fresh eating. Honeycrisp originally was thought to be a cross between Macoun and Honeygold, but DNA testing has since disproved this; its parentage is Keepsake crossed with an unnamed seedling. The original seedling was planted in 1961 at the University of Minnesota Horticultural Research Center, but they were not introduced commercially until 1991. Try Cortland or Honeycrisp in the following recipe, singly or together. In a medium skillet, cook apples mixed with ¼ c sugar, 1 t apple pie spice, lemon juice and salt, over medium heat for 3-5 minutes or until apples are nearly tender, stirring occasionally. In a small bowl, combine cornstarch and 2 T water. Add slowly to apple mixture, stirring constantly until it thickens. Roll pie crust into 12-inch circles. Cut into 3-inch rounds with cookie cutter. Press lollipop sticks firmly into center of each round. Spoon a scant tablespoon of filling into each center. You will have filling left over. In a small bowl, whisk egg white with 1 t water until frothy. Use pastry brush or fingers to brush mixture around edges of each round of dough. Place a second round on top. Seal edges. In a small bowl, mix 2 T sugar and ½ t apple pie spice and sprinkle over top half of pies. Bake for 15 to 20 minutes, until pastry is golden brown. NEW APPLE RECIPES have just been published by Woman’s Day online at www.womansday.com/Articles/Food/Recipes/5-Amazing-Baked-Apple-Desserts.html. JUDGING BY THE FRUIT showcased at the Eastern States Exposition (“The Big E”), this is shaping up as an exceptional year for apple quality. We’ve featured apples from across the state at our booth in the Massachusetts State Building, and they have been outstanding in appearance and flavor. Atkins Farms (Amherst), Breezelands Orchards (Warren), Carlson Orchards (Harvard), Cold Spring Orchard (Belchertown), Hamilton Orchards (New Salem), Nestrovich Fruit Farm (Granville), Pine Hill Orchards (Colrain), and Red Apple Farm (Phillipston) have all supplied beautiful, flavorful apples to the fair. The varieties have included Cortland, Empire, Gala, Ginger Gold, Golden Delicious, Golden Supreme, Honeycrisp, Macoun, McIntosh, Red Gravenstein, Rhode Island Greening, Snow, and Suncrisp. The Big E will continue through this Sunday, October 3. IF YOU WANT TO PICK your own apples this fall, go soon. There will be plenty of apples to buy at your farmstand and in grocery stores throughout the fall and winter, but the crop will be picked sooner than normal due to the unusually hot spring and summer. In a typical year, the New England harvest lasts through October, but this year in many places the apples will be all picked by mid-month. It will be best to visit your favorite orchard by Columbus Day Weekend if you want to be sure that there is still fruit to pick. As always, call ahead to find out what varieties are available.